Phantoms are known for being ephemeral. They are manifestations in the corner of your eye. They were never really there in the first place. The Black Shadow Phantom Leather Jacket from Alpinestars is pretty much the exact opposite. 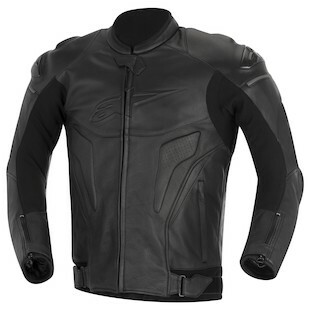 The aggressive lines of the Alpinestars Black Shadow Phantom Jacket look fast even off the bike. Cops will pull over the plastic hanger it comes on. People will get out of your way while walking down the sidewalk. Even your neighbors will yell at you to slow down when you go to your mailbox to get the mail. The Phantom is all business with external PU shoulder armor and a speed hump. It has darkened Alpinestars branding on the chest, shoulders, elbows, and lower back. The darkened logos give the jacket an ominous feel, something very different from the usual bright colors for which Alpinestars has become known. There is nothing casual looking about the Black Shadow Phantom. To put it in perspective, the Alpinestars Phantom Jacket is about as casual as an air horn in the middle of a performance of The Phantom of the Opera. Be warned, the Phantom leather jacket is not a figment of your imagination. Don't bother hiding under your covers because if this jacket doesn't come hunting for you in the middle of the night, Alpinestars' other Black Shadow Jackets, the Hades and the Huntsman, will.